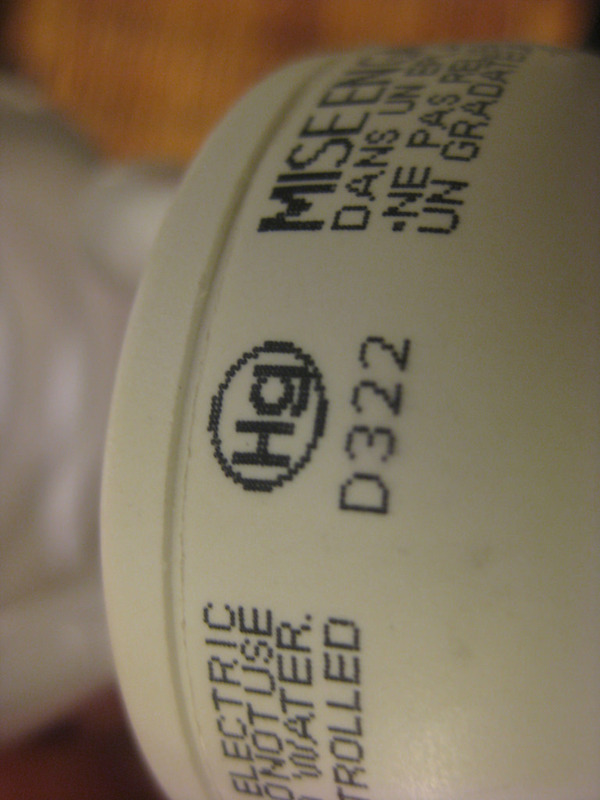 Do LED light bulbs contain mercury? I’m not sure. One Swiss lady said that they do. A couple weeks ago, she stopped to pick some rosemary herb at the place where I work. We only had a rosemary essential oil. Germany is big into drug-free medicine and natural approach to life. We had a long talk. Besides other stuff (like some Vancouver restaurant serving mouse meat and calling it “chicken” in a menu), she told that LED bulbs contain mercury. You know, these energy-efficient bulbs with beautiful white light? And don’t worry about the restaurant, it was 15 years ago. I wasn’t very surprised about the mercury. As these days people literally live on a pile of hidden dangers. Even Arctic Ocean is contaminated. When I went home and checked the bulb in my table lamp, I wasn’t very happy. A “Hg” labeling innocently stood out. I thought what an irony, my vision is not that great already, and now it turns out that my eyes have been absorbing this mercury-contaminated light for 2 years. It was a compact fluorescent bulb, but it doesn’t matter. What matters is I had no idea that there was mercury so close to me every day. I got rid of the bulb right away and put the halogen one. I won’t get into how detrimental mercury for your body. According to the Internet, seems like no. But still, it’s foggy, and I’d be cautious about using them. Because they do contain arsenic and lead. Which are bad in their own ways. What I now know is fluorescent bulls contain mercury. Maybe she meant fluorescent bulbs? I’m not sure. Check your bulbs. Whether it’s LED or fluorescent, ditch both. Get rid of these Trojan horses. Instead use the old-fashioned incandescent bulbs without coating or halogen. I’d also be concerned about using anything beside an incandescent or halogen bulb, because of the blue light. This I’ll be discussing in my next post.